Darfuri asylum-seeker and actor, Babaker (Babi) Ibrahim was arrested by Israeli police on July 18, 2013 for not having a receipt for his bicycle, which was presumed to be stolen. Babi, a well-known figure in the Sudanese community in Israel, is a member of a refugee troupe that recently staged a satirical play about the mistreatment of refugees in Israel, One Strong Black. 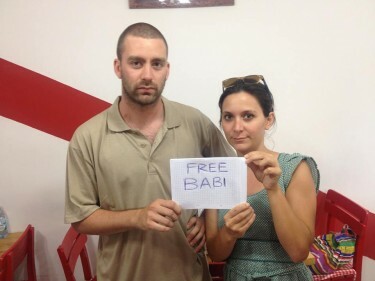 Babi's arrest and indefinite detention without trial sparked outrage and an online and offline campaign to release him and other refugees in his situation. In September 2012, the Israeli Ministry of Interior implemented a new regulation that allows the indefinite arrest and detainment, without trial, of asylum-seekers suspected of crimes, even if those suspicions are unsubstantiated and would have not led to a conviction in court. In July 2013, the regulation, The Procedure for Handling Infiltrators [the term used by the State of Israel to vilify asylum-seekers] Involved in Criminal Proceedings, was expanded to include refugees suspected of even misdemeanors. Over 500 asylum seekers have been detained under the Criminal Procedure and sent to the internment camps for refugees in the Negev desert until their possible deportation from Israel. אנו נמשיך להאבק למען שחרורו של באבי ושל כל הפליטים הכלואים בישראל ללא משפט. לא ייתכן שיתקיימו בישראל שתי מערכות משפט נפרדות: אחת לפליטים ואחרת לכל היתר. לא ייתכן שפליטים ייזרקו למעצר עולם ללא ראיות, ללא משפט הוגן, ללא יכולת להתגונן ומבלי שהמשטרה תצטרך להוכיח שהם אשמים בדבר. לא ייתכן שבמדינה דמוקרטית יתקיים נוהל שמשמעותו הנחה מראש שכל רכוש שנמצא בידיהם של בני אדם בעלי צבע עור מסוים הוא גנוב. After our habeas corpus petition was rejected by the High Court of Justice, yesterday we filed another petition on behalf of Babi… Our petition demands Babi's release and the abrogation of the regulations under which he has been arrested, claiming that the regulation is unconstitutional… We will keep fighting for Babi's release and the freedom of all refugees detained in Israel without trial. The existence of two separate legal systems in Israel: one for refugees and one for everyone else cannot stand. It is outrageous that refugees are sent to life in prison without evidence, without a fair trial, without the opportunity to defend themselves and without the police having to prove that they are guilty of anything. A regulation that it predicated on the assumption that all property possessed by people of a certain skin color is in fact stolen cannot exist in a democratic country. הבלוג פותח בפני קוראיו את פינת הרולטה – נחשו מה יהיה הצעד הבא. ההימור שלנו – מבקשי מקלט שלא יוכלו להציג קבלות המוכיחות כי רכשו את הבגדים שלגופם ייעצרו. כך נבטיח כי כל מבקשי המקלט יסתובבו בעירום. 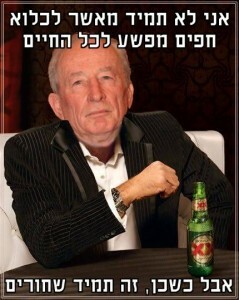 או שאולי, בעצם, כך נבטיח כי כל מבקשי המקלט שיסתובבו לבושים ייעצרו בגין עבירת גניבה, וכל מבקשי המקלט שיסתובבו בעירום ייעצרו בגין התערטלות במקום ציבורי. The blog opens the roulette section before its readers – guess what will be the next move [by the government]. Our guess – asylum seekers who won't be able to present receipts proving that they've purchased the clothes on their back will be detainees. Thus we will ensure that all asylum-seekers will walk around naked. Or maybe, actually, this way we will ensure that all clothed refugees will be detained for stealing, while all the asylum-seekers who walk around naked will be detained for indecent exposure. The Facebook page freeBabi was launched, quickly gaining hundreds of “likes”. The page asked users to submit photos and videos of themselves asking for Babi's release. Many sent in their photos, including famous Israeli actors and musicians. The producers and directors of the play One Strong Black visited Babi in Giv'on Prison on July 23 and informed him about the ongoing campaign to release him. 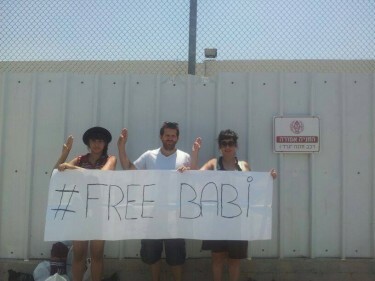 Babi is set to be transferred to the Sahaornim internment camp on July 24. The campaign received attention in Turkey, Tunisia and Greece as well. Simge and Vulkan from Izmir, Turkey, took this photo of themselves. 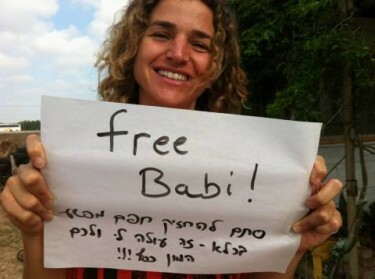 UPDATE: Following the online and offline campaign, Babi has been released from the Saharonim internment camp on the night of July 24, 2013. The procedure that made his indefinite detention without trial is still on the books and is being applied to refugees.